Create a patriotic theme from the bottom up by placing red, white and blue throw rugs or bath mats on the floor. Carry the color scheme through with throw pillows and blankets, along with candles and other tabletop accessories. Who says wreaths are only for fall and winter holidays? Dress up your front door, patio or balcony with one of these festive DIY 4th of July wreaths. Make a quick garland by folding red, white and blue bandanas in half diagonally and tying each end to a string. Sparklers make great favors or place tags. Simply tie a group of 10 or 12 together with red, white and blue ribbon and curl the ends. Don't feel obligated to stick with a patriotic theme. Add variety by going with "Christmas in July," "Luau" or "Mexican Fiesta." Set up a hot dog and burger "cart" on a tabletop with condiments and toppings such as cheese and veggies. If you want to go beyond traditional, include gourmet options like tapenade, salsa, guacamole or sliced avocado, roasted red pepper and pesto. Delight your guests with this layered punch that's as pretty to look at as it is tasty to drink. Have a build-your-own-soda bar featuring red, white and blue soft drinks. Include vanilla ice cream and extras of your choice such as whipped cream, maraschino cherries and sprinkles. Keep the soft drinks cold in a bucket of ice that can double as decoration. Your guests will get a big surprise when they bite into these delicious cupcakes cleverly disguised as snow cones. Use mini cookie cutters and wooden skewers to create melon kabobs. Display them in half of a carved-out and scalloped watermelon. 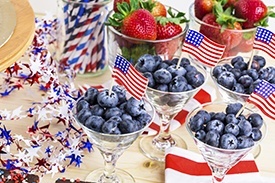 What's your must-have dish for a 4th of July celebration? Share it with us in the comments!